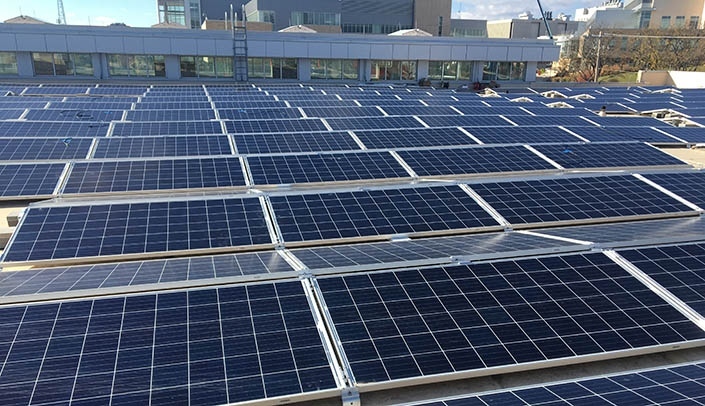 The 1,487 solar panels sit atop the three largest roof surfaces on the UNMC campus. The panels can generate up to 500 kilowatts of solar-powered electricity to help power the campus, and “its energy production will equal the average annual electricity use of 60 homes in OPPD’s service territory,” said Jared Friesen of Morrissey Engineering, which designed the project . . . Darren Dageforde, executive director of utilities and energy utilization for UNMC, said the med center already has made great strides in reducing energy use and increasing efficiency. “Having a renewable energy source on campus demonstrates our commitment to being carbon neutral by 2030 and parallels our mission to create a healthy future for all individuals and communities.” Read the entire article here. This entry was posted in Green Campuses, Nebraska / Midwest News and tagged Innovative community partnerships, Omaha Public Power District (OPPD), solar energy development in Nebraska, UNMC's commitment to being carbon neutral by 2030, UNMC's Live Green Initiative on February 5, 2019 by Helen Deffenbacher.